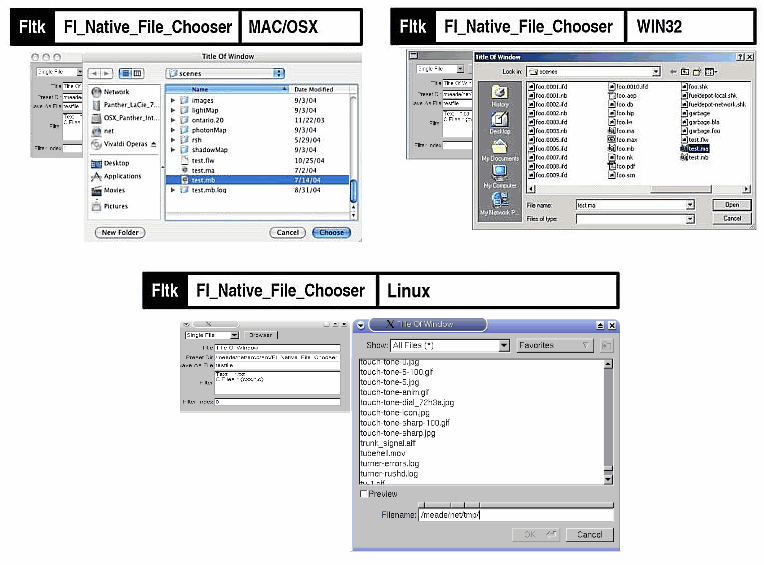 Fl_Native_File_Chooser is a cross-platform widget that lets you bring up the operating system's native file browser with a unified API. The Fl_Native_File_Chooser project was designed so as to either be installed as a subdirectory with your code, or merged into the FLTK main tree. UPDATE April 10, 2010: In 2009 this widget was added to FLTK 1.3.x, which makes this page obsolete. For the latest version of this widget, see the FLTK 1.3.x version of Fl_Native_File_Chooser. This page remains frozen at version 0.86 for backwards compatibility to older FLTK releases. All newer development of this widget will be in the FLTK 1.3.x release. There are release notes and Readme files that come with the source (tar file below) which you can browse, a simple example test program (above images) showing how to use the widget, and documentation for both fltk1 and fltk2. NOTE: As of Version 0.84 (Sep 30 2007), both fltk1 and fltk2 are being simultaniously supported.